Despite having a first class ticket to ride, some of comics best often get left to wonder the platform aimlessly. In Lest We Forget, I pluck a limbo-lingerer from the station and pimp their reason to return. 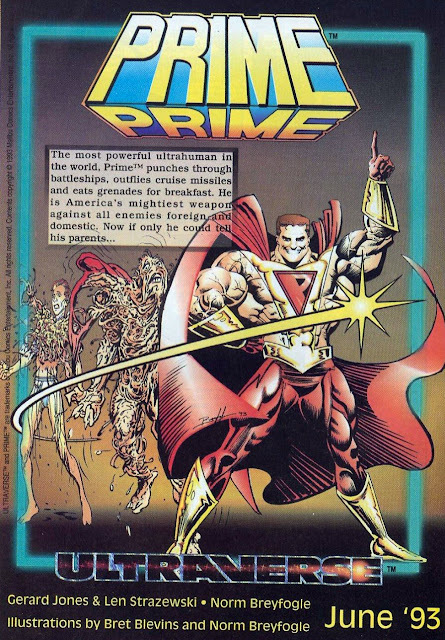 This month, the flagship of the criminally cut short Ultraverse line; Prime. I loved Malibu's Ultraverse, right from it's first full page solicits in the now defunct Advance Comics. Prime, being one of the lines first three titles, was more than simply an ickier version of DC's Captain Marvel. Rather, thirteen year old Kevin Green's adventures as earth's mightiest marvel, addressed mature subjects DC wouldn't place its highly copyrighted icons within a mile of, such as sexuality and pedophilia - viewed through a teens eyes, and came out on top because of it. 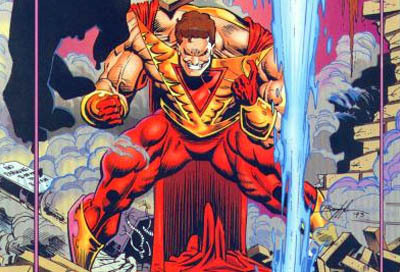 Further more Ultraforce's most powerful member had his powers and appearance defined by Kevin's own mental perceptions. Not only did this mean the true limits of his speed and flight went unchecked, but if he was inspired by darker heroes, his Prime body would look darker as a result. If he needed a version that could survive in space, that's what the slime that sprouted from his torso would form, and so on and so on. This means before Marvel purchased the Ultraverse in 1994, we never got to fully see the possibilities of Medieval Prime, Caveman Prime and more! HOW I’D BRING PRIME BACK: I think theres a strong calling in comics for a new creative, imaginative universe, one free from brand 'JLA' or 'X'. Malibu's Ultraverse was that place and even under the Marvel/Disney umbrella, still could be. If creator issues could be ironed out, a strong conceptual universe, primed for multimedia treatment and readers looking for a fresh start would be reborn. One heralded by a teenage boy who can bench-press city blocks in his lunch-break, but still has to finish his algebra assignment by three. Man I miss the Ultraverse! Such a great line early on. It definitely lost it's way after being purchased by Marvel. I'd love to see a return to those early days. Thanks Shag - I do too! I thought the Ultraverse was going to rule the school in the 90's. Even if Marvel is going to hold off on re-working the line for whatever reason, maybe we can get a few collections running? While the same creator issues probably apply, I'd love to see The Strangers collected!